St Matthew in the City, a progressive Anglican church in Auckland, New Zealand, has hit the news with their Christmas billboard. Joseph and Mary are shown in bed together, with Mary clearly not paying attention to Joseph. “Poor Joseph. God was a hard act to follow”. The sign has offended conservative Christians, one of whom took to the billboard with a can of paint only hours after the billboard was erected (See John Selkirk’s photo). Glynn Cardy, priest at St Matthew in the City, explains some of the thinking behind the billboard. 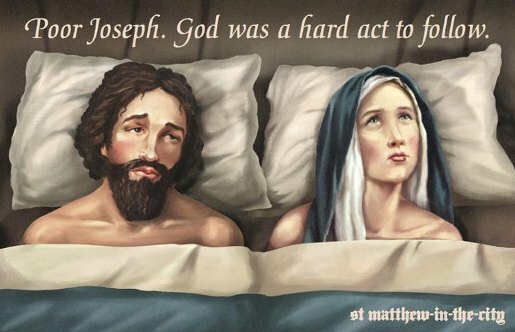 The Joseph and Mary billboard campaign was developed at M&C Saatchi, Auckland by art director James Bowman, copywriter Nicci Doak, account director Jo Harwood, group account director James Johnston, illustrator Dean Proudfoot.